Earlier this week I posted a little interview I did with the two people who make up London two-piece Psapp, namely Galia Durant and Carim Clasmann. It was kind of in conjunction with the release of their latest album, What Makes Us Glow. In some ways, it was quite beneficial to get the insight of the duo on how they make their music, what they're interested in; I find myself, right now, listening to the album thinking about the things they said about not basing songs on chords, making use of found sound via objects that on an everyday level are not deemed to be musical, finding accidental notes in certain things - "a hoover, a creaky door, a swing, a washing machine, a distant argument" - and creating melodies from them. The album begins as it ends, with field recording of rain dripping somewhere (or maybe something being fried), making it a cyclical experience, connecting the string of musical sounds, songs, with a snippet of everyday noises that show how the creative process is not an endless composition but a series of bright sparks in the mundanity of life. The first song I encountered from this album was the 'Everything Belongs To The Sun' - its strong emphasis on beats and chanting vocals, each with a tribal lilt, gives it an exotic appeal, painted by all the uncountable and sometimes unknowable amount of percussion infused into the song. Percussion - intricate, makeshift, homemade - plays a large part. Much less tribal but just as interesting are the scurrying noises of 'That's The Spirit' - alongside twisted, breathy organ sounds, the scuttling clips of percussion help provide a "noir" atmosphere, a sense of black comedy. That same spirit is found in 'The Cruel And The Bad', a kind of a hot & sweaty burlesque number with a macabre brass section and a galaxy of pinging noises mixed with claps and shakers in 3/4 time. 'Seven' plays out in a similar vein, whisking you away to some exotic, fantasy bar where candles strewn with melted wax light cabaret acts; it has a fresh atmosphere with a dark jazzy twist - sultry crooning, double bass, clean guitar chords in a funky progression, and there's even a background sample of someone shouting. The bossa nova rhythm and woody percussion of 'In The Black' takes you to another tropical location. Plucked strings and a old guitar providing a lovely pizzicato melody, ending in a frenzy of Middle-Eastern-sounding melodies crossing each other. This one teeters over the friendly precipice of pop. And it's in the fuzzy arms of pop that we find single 'Wet Salt'. Luscious sweeps of percussion punctuate the song's catchy organ-type chords and melodies, as well as the richly layered vocals. A half-lament-half-celebration of the respective dirt and magic of city life, specifically in London, it dreams as much as it stays rooted to the ground. But it's here that we first see the power of Psapp to create ear-friendly tunes. Likewise, 'Your Hot Knife' is a head-bopping toytronic pop number. It's evident in its core of low electric piano chords, the vocal patterns and the way they flow in delicate harmonies. It's one of the most upbeat songs on the album and is certainly easy-on-the-ears. Some great found sounds too: for instance, a bell from a bicycle. The organ solo towards the end is a lovely subtle touch. 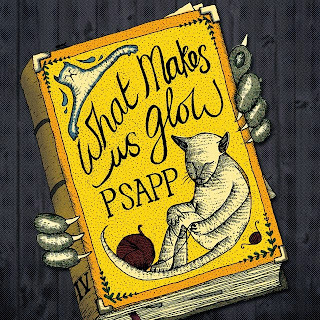 In a similar pop vein, the title track 'What Makes Us Glow' is really lovely. A warm and calming track soaked in comforting and playful melodies, familiar vocals float in rich harmonies especially in its chorus refrain of "We choose what makes us glow". It's a sitting-by-the-fire kind of song. Those playful melodies are a real strongpoint of the duo, strong in most songs but in particular in 'The Well And The Wall'. The way the strings are here at the start give it a baroque feel. Or even before that. It's like lute music. A medieval feel, the vocals plaintive. It gradually falls into a mind-bending subversive version of some kind of courtly dance, with lightly crashing cymbals and glitching bleeps. But it's not all about being busy and bustling. Psapp do minimalism, too. Each sound in 'Bone Marrow' is allowed to breathe in uncrowded space. Cutesy bells and woodblocks add percussive flair whilst the different vocal tracks in the chorus are layered with a simplistic intricacy. I found 'In And Out' to be a similar experience; starting with sound of someone breathing in and out, or maybe someone pumping bellows or something, it's another homely number that sleeps with dreamy chiming xylophones, bristling with pinpoint percussion, violins enriching with their organic woodiness. These sounds remind me of the music from Zelda: The Wind Waker; woody, organic noises that rattle in a light fantasy world of trees and magic. 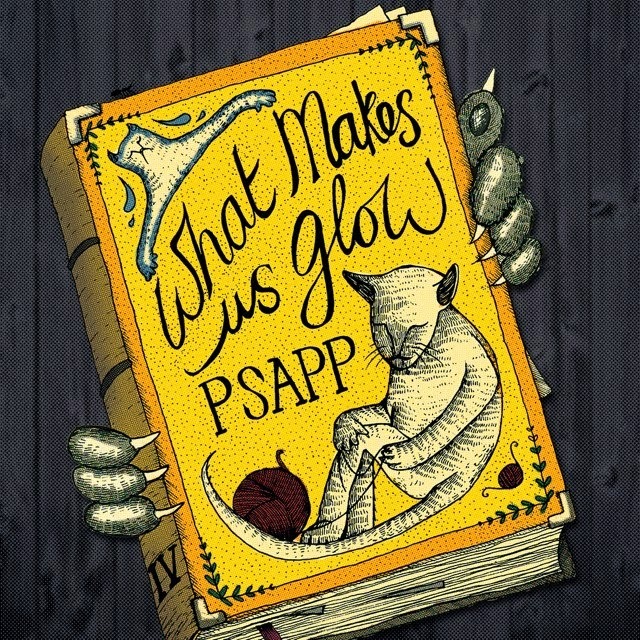 And it's on that note that the true nature of Psapp's What Makes Us Glow becomes apparent. It's not a clashing but a melding of worlds: the bustling cosmopolis on one side and the essence of natural folk on the other; electronic noises and pioneering experimentalism, yet a delicate organic touch with pre-electricity conjurings and orchestrations. And with the duo saying in the interview that they want to carry on being more experimental, with increased found sounds and field recordings, as well as writing scores for more traditional instruments, it seems that this twoness of Psapp is going to go through intensive development. And there's nothing better for music, or even the universal creative process, than directive forward-thinking that is not forced, but freeform and fuelled by passionate curiosity. Stream What Makes Us Glow on Hype Machine and/or buy it on iTunes.